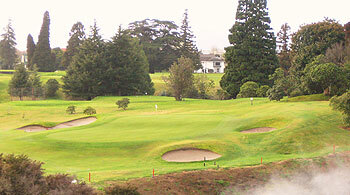 The Rotorua Golf Club is more than one hundred years old, with members having celebrated its centenary in 2006. The original club members played at several different locations before finally settling at the Arikikapakapa Reserve in 1912. There still remains some debate over who is the club’s landlord – it seems the Crown did not pay the Ngati Whakaue iwi (local Maori tribe) for the land in the late 19th century, but assumed responsibility for it under the terms of a wider agreement. There are also current negotiations over possible transfer of the land back to the local Maori people. The first course was a 9-hole affair but this was extended to an 18-hole layout seven years later. Charles Redhead, an Irish engineer who came to have a hand in the design of seven of our Top 30 ranked NZ courses, joined the club in 1924, and oversaw a remodeling of the course over the next 10-15 years. Alister MacKenzie met with Redhead at Rotorua during his short visit to New Zealand in 1927, but it's not known specifically what advice the doctor imparted. In the late 1990s, the Arikikapakapa course was upgraded; all of the greens were re-constructed, with some other layout changes that led to the establishment of the superb par three 14th. The highly porous pumice landscape of the property allows rainwater to drain rapidly (after even the heaviest of storms) so the course is rarely closed. Other unique natural features on the Rotorua course include bubbling mud pools, steam vents, sulphur mounds, steamy, warm water creeks and a huge thermal crater to the left of the 14th hole. The toughest hole on the course, the long par four 3rd, provides an early test. Tee shots need to land short of a hot creek, leaving a mid to long iron approach into a raised target that falls away sharply on the left. Of the four par threes on the card, the best known is the 9th as it has featured on a New Zealand postage stamp and has been written about by many golf writers down the years. Holes 14 to 16 are played around a lake – where steam can be seen to rise on chilly mornings in the winter – and many rounds have come to grief on this stretch so late in the round. But the 18th is a favourite of many as the views from the elevated tee across to the Whakarewarewa thermal reserve and the hilly woodland beyond are simply sensational. There’s no doubting that the Arikikapakapa layout is a unique golfing experience – the hot geothermal lakes, bubbling thermal mud pools, creeks with warm water running through, and a geyser erupting every so often in the distance, not to mention that pervasive malodorous tinge of sulphur (you get used to it, honest). The ground itself is also unusual – millennia of geothermal activity has left the ground crumpled like linksland; although perhaps the ripples are less pronounced but more concentrated. Apparently there is plenty of movement still happening; green and fairway contours have noticeably changed by themselves in recent years. But most of this is inconsequential when considering architectural merit. Does it matter how warm the water hazards are? (I suppose you might be more tempted to do a Van Der Velde if you weren’t going to get cold trotters). From a purely design standpoint, I found the first twelve holes rather average, except for the excellent long two-shotter 3rd hole. Whenever I found interesting fairway contours or green complexes, it seemed to be offset by unfortunate features such as intrusive OOB fences down the entire length of a hole (which I hate – no room for a bold recovery shot), mature trees over-prescribing the line off the tee (stifling strategic decisions), or a semi-blind short par-3. Even the ‘famed’ short 9th was slightly disappointing; maybe I was expecting too much? A nice enough short hole, but a case of ‘trouble left, trouble right’ – no mental questions asked, just “hit it straight”, which does not smack of genius to me. Then it starts to warm up on the 13th, before the course really catches fire from the 14th tee. 203yds / 186m from the back tees, this stunning par 3 intimidates with a thermal lake, bubbling mud pit and various shrubs encroaching, with the only bail-out long and left. The last 4 holes retain the high quality, navigating around the geothermal features, asking diverse questions of the golfer as he or she tries to hold a score together.